It finally started to get warm in May and this meant I got out quite a bit more. 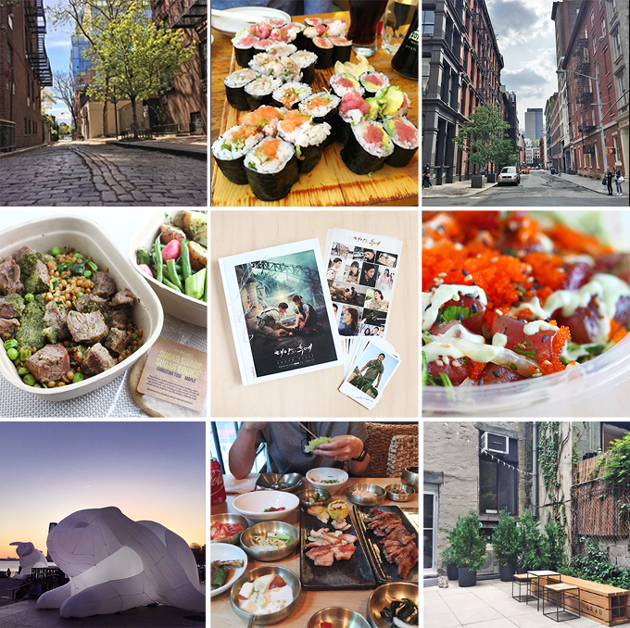 I use my Instagram as an unofficial food diary and love letter to NYC. These are just some highlights from the month. For more, click on over to Instagram and do follow along if you like what you see. This little alley in the West Village has been a favorite ever since I discovered it during the college. It has such a quaint old world feel that makes it seem like I'm not in New York anymore. We've been going out to dinner more during the week lately and that almost always includes sushi. I just snapped this cause I thought the scene looked interesting. I'm in Soho frequently for errands. We tried the Maple food delivery service for the first time when they offered this special meal of Spring Roasted Lamb served over wheatberries and green pea salad topped with a vinaigrette of mint, dill, parsley and lemon. This was the same dinner that was served at the Met Gala and it was delicious! A friend who just returned from Asia got me this Descendants of the Sun photo essay book. Thanks for enabling my obsession! Wise Fish Poké's West Swell Bowl with zucchini noodles. Poké seems to be the new food sensation in NYC and I'm not mad cause I love a good raw fish salad. Intrude was a very cool art installation at Brookfield Place featuring 7 giant inflated glowing bunnies. Our favorite kind of bbq is Korean bbq and we kicked off Memorial Day weekend at Miss Korea. This cute backyard garden in Greecologies is a great place to meet up with friends when it's nice out. They also have the most incredible fresh made Greek yogurt! The lucky winner of the Pretty Nails giveaway is Allie M! Congratulations Allie! Don't be sad if you didn't win! I have an exciting new giveaway starting on Monday where there will be 5 prizes! Hint: It involves one of my favorite types of skincare products. Come back and see me then! 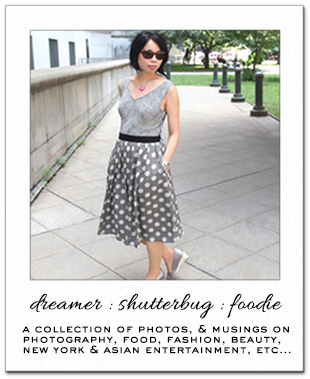 I love how you describe your Instagram as a 'food diary and love letter to NYC'. I like your idea of going out to dinner more during the week, I have a habit of keeping special meals to weekends and so I may need to take a leaf out of your book! Great images looking forward to your giveaway enjoy your weekend. They finally, finally have more korean bbq places in Atl, so I'm glad you're a fan too! I just had lunch, but your food pics make me hungry all over again. I love and hate your IG feed, Rowena, it always make me sooooo hungry. LOL! And congratulations to Allie! I love your instapics Rowena! Love letter to NY...and what a lovely love letter it is! Plus, I don't mind the food diary part either....I'm a total foodie so I enjoy that a lot. Fabulous photos dear! I love your insta feed. I get blocked on instagram often so I'm not as active there as on my blog, but I still enjoy using it and your instagram profile is really wonderful. As always love your round up of snaps and that bunny installation I must check that out! Beautiful pics, Rowena. Looking at the food pics.....oooooh my tummy… can you hear it rumble? mouthwatering. Have a beautiful Sunday, doll. Your pictures are always fantastic! Ah, those glowing bunnies are so awesome:) Have a wonderful morning, sweetie.